What is Anthrax & where could you find Anthrax in buildings? Anthrax is a disease. It is a bacterium which produces spores. These spores survive for years and years in many environments. If these spores enter a human they become live and cause life threatening disease. They enter the human body through inhalation, ingestion or directly into the blood stream through cuts and abrasions. Anthrax is present in millions of buildings throughout the UK. The reason for this is the construction methods used in the past. For many years plaster used in buildings was reinforced with hair taken from many different animals. If the animals that the hair was taken from were infected with Anthrax then the reinforced plaster contains the Anthrax spores. During refurbishment of any building which contains hair reinforced plaster there is a real risk of the dust and debris from these works causing disease to anyone coming into contact with it. It may remain present when works have been completed and can cause contamination to other areas such as soils and other surfaces. What should I do if I think Anthrax could be present? 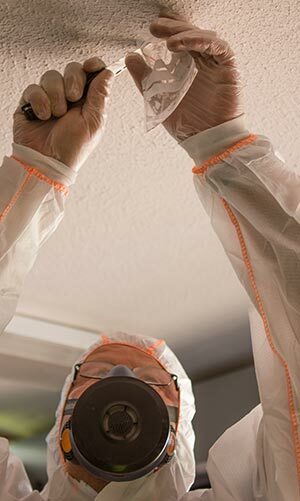 If you are planning to work on any building or site where there is a possibility that the plaster you may be disturbing is an animal hair reinforced type then you must get it checked. Do not disturb the suspected material or location until you have had sampling and testing completed. If you have already started work then you must stop and ask us for professional advice. How do Oracle carry out sampling & testing for Anthrax? One of our trained surveyors will visit the site, anywhere in the UK. The surveyor will take representative samples of the suspected material and carefully package the samples ready for transfer to the laboratory for testing. Once the testing has been undertaken you will be provided with the certificate of analysis and results. From there your consultant will explain any steps you need to take and will give you the best advice to deal with any Anthrax risk. If you would like a fast and free Anthrax sampling, testing or surveying quotation call us now on 0844 800 0801, or please complete the enquiry form below and one of our team will be in touch as soon as possible.